I think I could use these skinny fabric organizer baskets by Ayumi from Pink Penguin in every room of my house! Finished dimensions are 2″H x 9 1/2″W x 2 1/2″D. 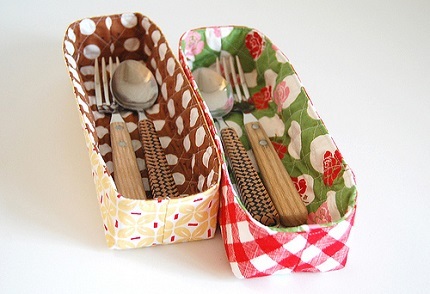 They’re the perfect size to organizer flatware in the kitchen, make-up brushes or toiletries in the bathroom, sewing threads in my craft room, etc. She shares a tutorial showing how you can make one. Get the tutorial for these awesome organizers at Pink Penguin.